Nothing makes us sadder than the unnecessary loss of an old pub. Especially one that still has skimpies. And by skimpies, we obviously mean a long and interesting history. Yet lose it we might, if plans to demolish the Darling Range Hotel for yet another service station go ahead. Built as the East Midland Hotel in 1905 for Thomas Wilkins, the site was chosen so patrons could sit on the balcony and watch the horses at the Helena Vale Racecourse. Naturally, it became very popular. In 1914 it was sold to a man with the wonderful name of Welbourne Keatley Lamzed, who arrived just in time to take advantage of a new source of customers: the men doing basic training at Blackboy Hill. No one liked the way the YMCA was running the camp’s alcohol-free canteen, and a rival wet mess for the men was quickly shut down after wowsers complained to the newspapers that soldiers shouldn’t be allowed a pint after a hard day’s training. So the Darling Range Hotel, newly renamed and redecorated, was one of the few sources of beer for the men. However, someone started a rumour that Mr Lamzed was (whisper it now) a German, and no patriot should be drinking in his venue. The rumour was, of course, a complete lie, Lamzed was born in East London, much to the relief of those doing their training. 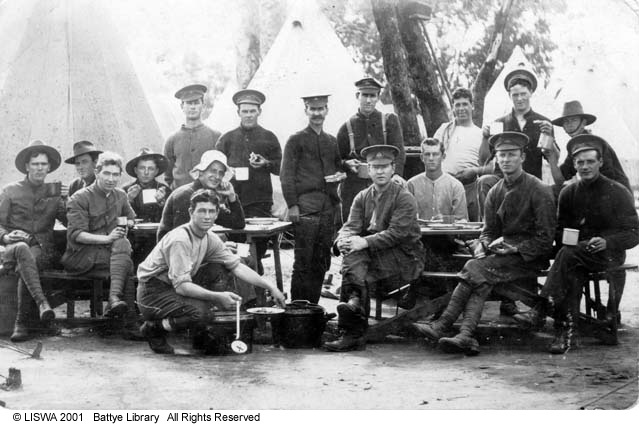 In fact, he had supplied the short-lived wet canteen at Blackboy Hill, and argued that men should drink at the camp, rather than coming to the Darling Range Hotel, since there would be less temptation to go AWOL after a few glasses. And Lamzed said he didn’t really want all the new customers anyway, since he had bought the pub as a quiet retreat to live out an easy life after a career spent in the construction trade. As a side note, Lamzed had erected Boans first ever store, so he has more than one claim to fame. But the wowsers won the day, the wet canteen stayed closed, and the Darling Range Hotel became the main drinking hole for those ANZACs about to serve overseas. Today you drink in a new tavern built at the back of the old building, which has lost much of its charm with the loss of the verandahs. But that’s still no excuse for knocking over part of our military and boozing history. Go have a drink there. Take a selfie outside the original hotel, and tell JDAP to keep their planning paws off one more piece of our heritage. What do Sherlock Holmes and speaking to the dead have in common? The answer is, of course, Arthur Conan Doyle, who visited Perth in 1921 as part of a world tour. But he wasn’t here to plug his books. 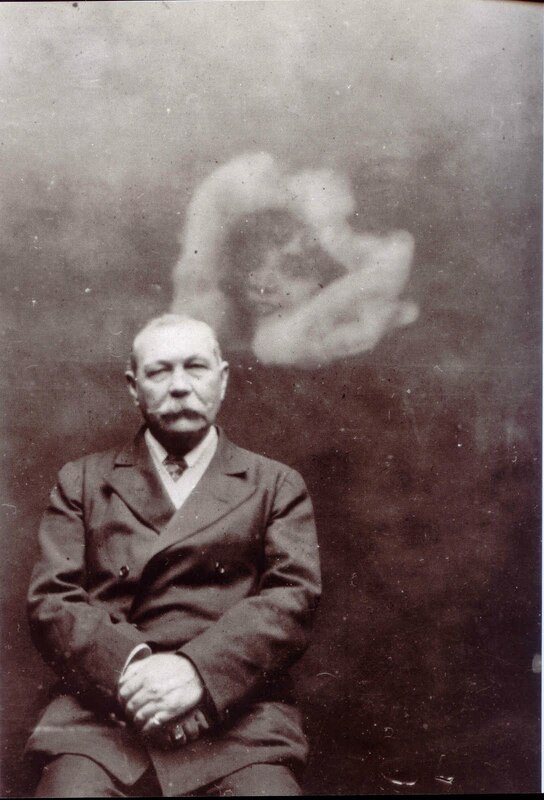 Instead, Conan Doyle wanted to talk about his latest obsession, spiritualism. And His Majesty’s was packed out for the lunchtime event, with almost everyone in the audience being female. But we’ll come back to that. Conan Doyle briefly sketched out the history of contacting the deceased, announcing that anyone who denied the existence of life after death was “either ignorant or a moral coward”. Certainly, the audience were receptive to the idea. Especially when the speaker mentioned that his good friend, the brilliant scientist Oliver Lodge, had talked with the boys who had been killed in World War I. Every person in the audience had either lost a son or a husband in that conflict, or knew someone who had. Their bodies might not have been brought home, but now someone was offering a chance to say farewell. “That,” said Sir Arthur from the stage, “is the message we have tried to give Australian mothers.” Mothers. Conan Doyle clearly knew who his audience was. He had even spoken to his own dead son, Kingsley, who died in 1918 from the flu epidemic which raged across the world. A medium had relayed the words to Conan Doyle, who discovered that Kingsley was happy in the afterlife, and he even felt the touch of his son on his forehead. How much excitement would that have created in an audience of mothers? An undoubtable, serious writer was proclaiming the very real possibility of once again speaking with lost children. How many tried and failed after this, we will never know. There is no doubting Conan Doyle’s sincerity. He was no con artist, and was prepared to face ridicule for promoting his beliefs. Many of his friends tried to discourage him, not least Harry Houdini, the famous escapologist. But for Sir Arthur, this would mean giving up the belief he had finally said goodbye to his own son. Speaking to the WWI dead is not usually thought of as part of Anzac history, but it fully deserves a small place in the tales to be told about 1914 to 1918. Please stop assuming that all young Australians who run away to join ISIS have been brainwashed. Teenagers (in particular boys) have always sought adventure overseas, and have rarely understood the full implications of what they were getting themselves into. Also, dear journalists, stop with the overuse of the word ‘radicalised’. It’s not a thing. 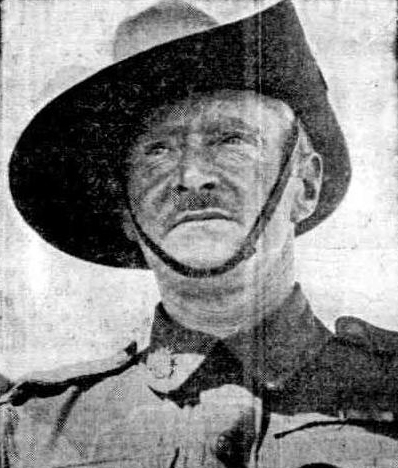 So, today Dodgy Perth presents the story of Captain Leslie Shaw, who signed up to be an Anzac at the age of just thirteen. Born a Kiwi, Leslie served as a sapper in the First Field Company, New Zealand Engineers. He was present at the landing on Gallipoli and also at the Suvla attack. After Gallipoli he went to the trenches in France, taking part in the Battle of Messines and the Third Battle of Ypres, in 1917. Then, at the ripe age of 17 years, tiring of a foot-slogger’s existence, and anxious to join the Air Force, he disclosed his real age and was discharged from the Amy. This after some years on active service. After the war Leslie served with the Air Force in India, before retiring to take up a tea plantation. Bored of tea, he joined the flying service in New Guinea, being one of the first to fly in that service. Finally ‘retiring’ to Perth, he became a broadcaster with radio station 6AM, and his talks on aviation became one of its most popular shows. But even then, Leslie wasn’t finished. When WWII broke out, he was still young enough to enlist as a private, again in the Army, and undertook his basic training at Claremont. Do you really believe that at the age of thirteen Leslie could have fully understood what he was getting himself into at Gallipoli and in the French trenches? Of course not. He wanted adventure, and he wanted to serve his country. Dodgy Perth does not mean to equate joining ISIS with being an Anzac. One of these organisations is evidently not a good thing. However, sometimes boys will be boys, and it doesn’t always require them to be ‘radicalised’ before they seek thrills and escapades in foreign lands. As state war memorials go, WA’s is pitiful. The first meeting to kick off the project—in February 1924—was a sign it was always going to be a calamity. The Premier, Sir James Mitchell, chaired a meeting of mayors and architects. The intention was to discuss a location for the Memorial. Architect Michael Cavanagh proposed that the Government should subsidise any memorial, but Sir James sneered at the suggestion. It was for local government and the people to fund it, he said. The Mayor of Subiaco, Roland Robinson, told a sad story of how the residents of Subiaco had failed to donate enough money to build their memorial, so the council had to subsidise it. He was very sceptical that anyone would give for a state monument. Robert Bracks, Mayor of North Fremantle, agreed. No one would give to a Perth-based erection. In any case, King’s Park was an awful idea for a proposed location, since it was in danger of becoming nothing more than a “glorified cemetery.” Shouting broke out and the Premier had to repeatedly bang on the table to restore order. 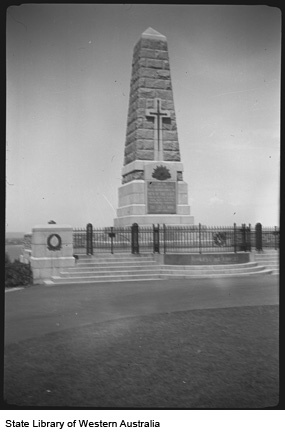 The Mayor of Fremantle seconded his neighbour, and declared there could only be one realistic location for a state memorial: Monument Hill in (ahem) Fremantle. He was never going to put his money into the city of Perth. And would the Premier like to have a look at Freo’s plans for a memorial? The Premier did not care to do so. William Berryman, a former Subiaco mayor, had no interest in monuments. We need hospitals he said, not pointless memorials. This made Michael Cavanagh cross, and he mocked the erection of “maternity hospitals” to commemorate the dead. A row then broke out between the architect and the Colonial Secretary, who apparently did like maternity hospitals. South Perth’s William Reid also wanted to boycott a monument in Perth. Somewhat imaginatively he proposed a war museum, with an inner shrine containing the body of an unknown Australian soldier. Or perhaps the money could be used for a ‘Hall of Industry’, where the State’s products could be exhibited. No one listened to the dissenting voices and it was decided that King’s Park would be the location, with no Government money made available. The subsequent outcome was predictable from the start. 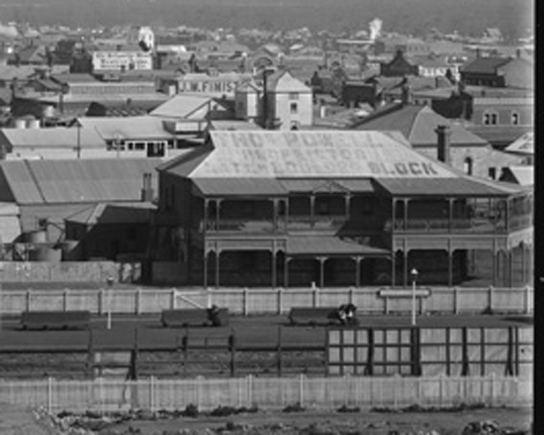 As part of Dodgy Perth’s ongoing quest to bring harmony and love between all sections of Western Australian society, we dig up a forgotten story of Italians and Australians brawling in Kalgoorlie. It all kicked off in August 1919, with a small disturbance between a few Italians and Australians, who had a brief fight at the Majestic Café. As the Italians left through the back door, one of them picked up a knife. Later that evening, the same group of Italians, still looking for trouble, brawled with some young men at the corner of Hannan and Porter Streets. In the commotion a returned soldier, Thomas Northwood, was stabbed in the buttock by Jim Gotti, a 23 year old Italian. Northwood bled profusely, and although several people tried to assist, none of them knew first aid. By the time the doctor arrived, it proved impossible to save him. Meanwhile, another returned soldier had been stabbed, although without fatal results. As the Italians headed towards the Glen Devon Hotel—the main watering hole for Southern European woodcutters and miners—they broke windows, and fired shots from a revolver. As news of Northwood’s death spread, a bell ringer walked through Kal’s main streets summoning all returned soldiers to assemble the next day. Several hundred did so at the Soldiers’ Institute, determined to get their revenge against the Italian community. The Resident Magistrate addressed the crowd and appealed to the men not to use violence. The Italians would soon be back at their camps on the woodline, he said, and the whole thing will be over. The crowd was having none of it. “They must leave the country,” was the chant. The returned soldiers agreed not to take revenge if the Government deported all Italians and closed all Italian-owned hotels. And, if all Italians had not left the goldfields by Saturday night the consequences would be severe. A couple of hundred young men still decided to make their feelings known at the Glen Devon Hotel. Despite a strong police guard, a number managed to force their way in to confront the patrons. Perhaps unsurprisingly, the hotel was deserted. The would-be rioters decided to help themselves to a few drinks, and tore down an Italian flag hanging behind the bar. They then moved on to another hotel where Italians were known to drink, where windows were broken and more booze stolen. But failing to find anyone to fight, the crowd slowly dispersed. The Italian community was not prepared to risk staying in town. Some fled to Perth, while others went to the camps on the woodline a few kilometres from Kalgoorlie. A few Italian families remained, but it was promised that these would be left in peace. One of the more unpleasant aftermaths of the whole affair was a general mood across the State that employment should only go to Britishers and that ‘aliens’ should be forbidden from either employment or renting houses. Preference for our own? Foreigners taking our jobs? Sounds familiar, somehow. You get the point. Anzac is a bit more than a military term. It’s a word full of emotion and value. Value in the ‘give me all of the money’ sense, that is. The wonderful Ms History Punk has exposed the cashing in immediately—really immediately—after the word Anzac was coined. It wasn’t even an official word at first, just a nickname. It wasn’t even popular with some soldiers. So Ms Punk explores the seedy world of business folk safe back home in Australia who never missed a chance to make a little extra. Like the Imperial Boot Co on Hay Street who announced an Anzac Sale in 1916. Yep. Apparently all those Anzac heroes going off to war meant they weren’t buying footwear like they should have been. And the poor shop was overstocked. So here was your chance to get some cheap shoes before the soldiers came home and the prices went back up again. That’s what they meant by Anzac Sale! If you were in Bunbury during WWI and fancied a cool drink, fruit, lollies, or perhaps some beef or ham, we’d recommend the deli quickly renamed The Anzac to catch the current mood. Or if you were in Kalgoorlie, why not eat at the Anzac Grill Rooms? Didn’t get a residence built for you by the local community? Presumably that’s because you weren’t a wounded serviceman. Never mind, estate agents will still sell you a lovely house as close as possible to Mt Hawthorn’s Anzac Cottage. Really close if you can afford a bit extra. And finally, not serving overseas? Well you can pretend you are by buying some Anzac badges and Anzac hat pins to wear on Anzac Day. Then you can imagine you’re playing your part. And Boans can make a profit. By coincidence, of course. Anzac puddings and Anzac pies. Anzac buttons and Anzac booze. For a sweet little Anzac honeymoon! We were spared this nightmare when the Government suddenly banned the use of the word on anything commercial. But you should still go to Anzac Cottage. And eat an Anzac biscuit. And be thankful we were spared Anzac socks. Although a pint of Anzac booze would go down nicely right now. Basic training for World War I took place at Blackboy Hill, a couple of kilometres east of Midland town centre. The YMCA won the contract to provide the canteen at the camp. Trouble is, none of the enlisted men liked the way The Y ran the place. Instead of providing a service at a reasonable price, the canteen was basically run to raise money for the YMCA. The manager of the canteen was vastly overpaid, and they even had the nerve to charge rent to anyone on site wanting to use the canteen for a meeting. The building had been built by the Army! All in all, the men serving their nation felt completely ripped off. The officers weren’t happy about this situation, so on Monday 28 September 1914, a rival ‘wet’ canteen was opened in a tent at Blackboy Hill. This would be good for morale, said the officers. It will keep the men on site and away from the local pubs. In any case, it would let the officers know how much the men were drinking, and restrict them to beer rather than spirits. A welcome improvement to the training camp. No one could possibly object to this. Naturally some pasty-faced wowser, the Mike Daube of his day, took to the letters page to rail against this threat to civilisation. Having a beer would turn soldiers to cowards, he screamed. They would become tired, be unable to shoot. Every military virtue would be wiped out as soon as a glass was poured. In any case, drink leads to horrible, horrible war crimes. Apparently. Perhaps it had not been wise for the officers to have seized one of the YMCA’s tents for the new canteen. The Y retaliated to this insult (and to the end to their monopoly) by requesting that the camp commandant ban the consumption of beer at Blackboy Hill. He rightly told them to get stuffed. But the YMCA were not to be put off. They drafted an urgent telegram to the federal Minister for Defence, explaining that the “young soldiers of this State” needed protection from the awful officers at the camp. And their “social work” was becoming more difficult, since no one wanted to eat at the old canteen anymore. At 2 o’clock in the afternoon, on Sunday 4 October, orders came in from high command. The wet canteen was to be closed. It had survived less than a week. This is an edited re-post of an earlier article. But we like it, so are sharing it again with our new followers.